‘At the high point of the crisis, Campobello had a dialogue with the non-entity’. What a wonderful opener; full of intrigue and abstract uncertainty. 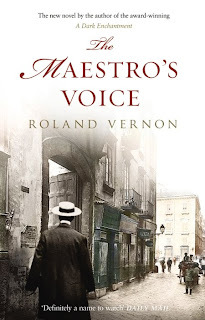 This is how we are introduced to the novel’s protagonist, Rocco Campobello; the Maestro, ‘the great tenor’, ‘the first big star of the modern era’. The first section continues by detailing this dialogue with the non-entity, which raises questions about the purpose of life and all its existential confusion. Chapter Two gives us a transcript of an interview from 1986 (60 years after the main focus of events in the novel). This transcript reveals crucial information about Campobello and hints at some fascinating secrets and lies that the rest of the novel will uncover. The reader will have access to the ‘true story’ that is ‘dark, too dark’ for most audiences. Roll on, I thought, excited about what was in store. ‘There was an unsettling atmosphere in the house, an impermanence, as if its homeliness had been purchased and contrived overnight, to give an impression from the outset of settled domesticity; but it had no more substance than a stage set, and felt as if it might be taken apart, flat packed and shipped out again in an afternoon, leaving not a trace of itself behind’. For all its lengthy wordiness, this sentence has within it resonances of the major theme of the novel; that of appearances being deceiving and nothing ever being what it seems. This theme penetrates almost every aspect of the novel, and would ordinarily fascinate me, but I think it was all too wordy for me to engage with. The story of The Maestro’s Voice is great, with archetypal goodies and baddies at war with each other. There is bribery, adultery, fame and duplicity. But the plot development is too slow for me to catch onto. The novel charts Campobello’s life, from his childhood to his death and beyond. He appears at first as a huge enigma, and we get to know more about the people around him, and his reputation, than we do him. However, Campobello’s initial enigma is dispelled as the novel develops. We do not see or hear of Campobello as a ‘normal’ man until quite far into the novel. At the beginning he is a mega-star hiding in his home in Naples, too fearful to show his face to visitors. We come to know the ‘real’ Campobello as the narrative journeys back to his childhood and explores his relationship with his father and the circumstances of his big break in the operatic industry. There are some sensitive moments in the narrative that are genuinely touching, but Vernon doesn’t dwell on emotion, rather he describes events fairly objectively and quickly. I think this is a shame, as the most powerful parts of the novel are in these emotive moments, like when Campobello as a boy has to tell his father that he will not follow in his footsteps and become a blacksmith, but will instead leave home to be in the opera. The description of the lead-up to their conversation, and the exchange itself, really pulled my heartstrings. Equally, when Campobello’s faithful personal assistant is ruthlessly blackmailed by the Mafia, I really felt a strong sense of empathy for him. Vernon crafts these moments well, and I would have loved more of them. This novel has some very clear strengths and weaknesses. I felt it was too wordy and slow-moving. My biggest disappointment was that the novel did not continue with the brilliantly inventive narrative style of the first couple of chapters. However, the essence of the plot and central theme were captivating and the glimpses of emotion were touching. This is a novel for patient readers.